Santo Domingo is teeming with culture and history and it is one of the top destinations for tourists visiting the Dominican Republic. This is the most ancient city in the New World where American communities were founded. This is where the first cathedral and the first hospital can be found. Feel what life is like back in the 1600s by wandering through cobble stone streets while gazing at Spanish colonial architecture. This is the most diverse city in the Caribbean where a variety of restaurants and nightlife converged. Great restaurants are everywhere and even local residents find it hard to avoid them. Santo Domingo is a bustling city where activities go on day and night. It is a spot to meet new acquaintances. In fact, many singles who visited the place find a lifetime partner before departing the city. Shopping is not a problem in Santo Domingo. Popular shops around the world have extended their branches here and more will be coming in the future. There are even discount stores here where for less money you can splurge until your heart’s content. There are clearance sales held all year round while the more discerning tourists can go to shops that offer exclusive wear. 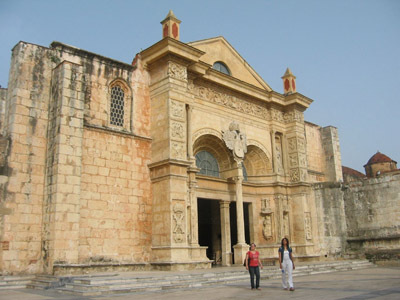 Santo Domingo can be found in the south area of the Dominican Republic. Tourists can get there through chartered busses. If you don’t have any company, you can get there by taxi from the airport. Search for the appropriate fares that are posted on the airport and make sure that you negotiate the pricing before you board the taxi. You can also rent a car to get to your destination. It is not hard to locate the city since the route is simple. You only have to travel through the Americas Expressway to Duarte Bridge past the 27 de Febrero overpass. But if you want to save money, public busses are cheaper then taxi’s to take you to the city.